One small step for you, one giant leap for cosmetics. When the Plymouth Lush store sent me an email to invite me to see their new summer products I was very much in two minds about going. I am a massively anxious person and the thought of having to be around people I’ve never met before filled me sheer, cold terror. I thought about it alot and with a little encouragement from the Lush Plymouth Twitter account and the lovely Becca from QueenBeeBecca I decided to be brave and go. So as the day of the event dawned, I was feeling very anxious and nervous, the lovely Tori had already offered to set aside a space for me should I need it, despite this I had managed to work myself up into quite a state by the time I got there. The evening started with a quick welcome from the Lush team, we were offered little cakes and chocolate truffles as well as drinks. All vegan and handmade locally. 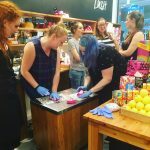 We were split into two groups to watch the lovely Lush ladies make a Comforter Bubble Bar – it’s a very recognisable product, swirly pink and white with a gorgeous blackcurrant and bergamot scent. We watched the pink part come together. It was really interesting and so similiar to cake making! Mix the dry ingredients, then the wet before leaving to rise! Whilst we waited for the mix to rise we went to see one of the new summer products, the hot oil hair treatments. These remind me of cake pops and they all smelled amazing (with the exception of the cinnamon one because we all know cinnamon is the smell of the devil), you basically stir the stick into a cup or bowl of hot water and wait for it to cool, before smearing it all over your dry hair, waiting 20 minutes and washing it all out. Each of the new hot oil hair treatments are vegan, with the exception of Hair Doctor which is great news, they also come “naked” so no wasteful packaging. Once you have mixed up the hair treatment they will keep for a while – up to 4 weeks and they suggested keeping them in one of the empty lush pots that you aren’t recycling. Genius idea. Next we got to see the new Jelly Face Masks, I am obsessed with face masks at the moment, I genuinely can’t get enough of them, so I was pretty excited to see these in action. We got a very lovely demonstration (and an excellent impression of a Weeping Angel from Doctor Who) from Eleesha and Lorna. You take a pinch of your mask (they all smell wonderful by the way) and rub it into your hands, then smear it all over your face. Leave for 15 minutes and wash off with warm water. These new masks don’t need to be kept in the fridge and keep for around 4 weeks. Each mask is inspired by important Lush Women. We then got the chance to make our own bubble bars! Using the mix that was prepared earlier, we had a demonstration on how to make the perfect swirl then got to have a go ourselves. Mine did not go well! We were gifted a jelly face mask and hot oil hair treatment as well as the bubble bar we’d made – just as well really when you look at the absolute travesty I managed to create! I picked out 1000 Millihelens jelly face mask – full of apple, witch hazel and green tea, this mask will brighten and firm skin. I went for the Yuge hot oil hair treatment, containing spearmint and sea salt to give volume, shine and conditioning. I am very excited to use both of these. It was nice to have a little look around the shop whilst it was so quiet as well. I am pretty proud of myself for facing my anxities head on and I’m glad I went. It was lovely to meet the other bloggers there. The Lush staff were wonderful, full of humour and masses of knowledge about their products and I’d like to thank them for the effort they went to in ensuring we all had a lovely time. Look out for some reviews of my goodies soon. What do you think of the new Lush collection? Get in touch below. Yayyy! I’m so proud of you for going to the event 🙂 Go you!